Remanufacturing of air springs for air suspension, made directly in S matic factory. S matic has: – its own line for remanufacturing of air springs; – Car Service which with a specialist who performs instalation and removal of air springs; – corporate department responsible for dealing with Car Services. S matic remanufacturing all types and brands of air springs with its own remanufacturing line. Through its remanufacturing factory we work with many Car Services in Bulgaria and Europe. S matic has its own machine for remanufacturing of air springs, like herself and know-how for remanufacturing itself was purchased directly from the U.S. 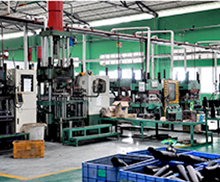 The rubber for air springs is prodused exclusively for us and all its lenght is stamped with the name of our company. This ensures that we have changed whole worn rubber.